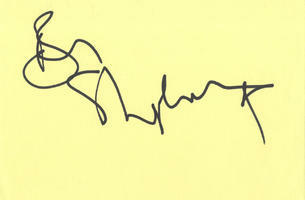 This is an In Person Signed Autograph Album Page 5.5" x 4" by the popular English Television and Radio Presenter. Benjamin Peter "Ben" Shephard, also known as "Sheps" (born Wednesday 11 December 1974) is an English television presenter who currently works for Sky Sports. His most recognised work is with the now defunct breakfast station GMTV as well as various roles within ITV.